All this chasing around after turkeys, tracking down Brussels sprouts and and non-stop catering doesn’t leave much time for blogging but I can’t let the season pass without sharing a couple of recipes without which, for me, Christmas simply cannot proceed. The first is for Mincemeat – the best way to whip up some festive cheer, filling the kitchen with heavenly spiced fruit smells that instantly bring on that Christmassy feeling. I use the mincemeat to make sinfully moreish mince pies for drinks parties or as a dessert (preferably with brandy butter). I bought all the ingredients except suet in INA Market. Suet, grated beef fat, is a throwback to pre-refrigeration times when mincemeat was a way of preserving meat. It’s not absolutely necessary and even without it you’ll make mincemeat that’s a hundred times better than the shop-bought variety. Beef and vegetarian suet is available at Modern Bazaar in Vasant Lok – although don’t be tempted by their ready-made mincemeat, it’s way too spicy. Once you’ve finished chopping and measuring, you’ve done all the hard work. Now all you have to do is put all the ingredients except the brandy (if using) into a large bowl. Mix thoroughly, cover and leave to steep for at least 12 hours, or overnight. The next morning, place the mincemeat, loosely covered with foil in a low oven (about 120 degrees) for three hours. As the mixture heats and the kitchen fills with a divine fruity spiciness, you may well find yourself humming Christmas carols and wishing goodwill to all men. When the mincemeat has cooled, stir in the brandy and either seal in jars (mincemeat keeps for months and is great in crumbles, pies and ice-cream all year round) or make up mince pies. This year I’ve been experimenting with different fats for the shortcrust pastry and I have to say good old Amul is the hands down winner, it gives the pastry a creamy saltiness which sets off the sweet mincemeat perfectly. It’s important to roll out the pastry as thinly as possible (my sister reminded me that our mother, a genius baker, used to say you should be able to see yourself through it). You want the lightest, slightest possible shell, just enough to enough to convey the mincemeat to your mouth. Our mother always made closed-top pies but somewhere along the line, probably under the influence of Nigella Lawson, I’ve started making star-shaped lids. Incidentally, Nigella also binds her pastry with orange juice instead of water, although I didn’t find it made much difference. You will need two pastry cutters, one 6cm, one star-shaped, and a greased 12-hole tart tin. Sift flour and salt then add the butter. Rub the butter into the flour gently with your fingertips until the mixture looks like breadcrumbs. Do this quickly and lightly and keep the mixture cool. Now add enough water or orange juice, a little at a time, to just combine the mixture with a knife then knead gently to form a ball. You want a firm, dry-ish dough that holds together but is not in any way sticky. Wrap the dough in cling film and leave to rest in the fridge for 30 minutes. Roll out the pastry as thinly as possible – I manage 48 pies from this quantity of pastry – and cut an equal number of discs and stars. 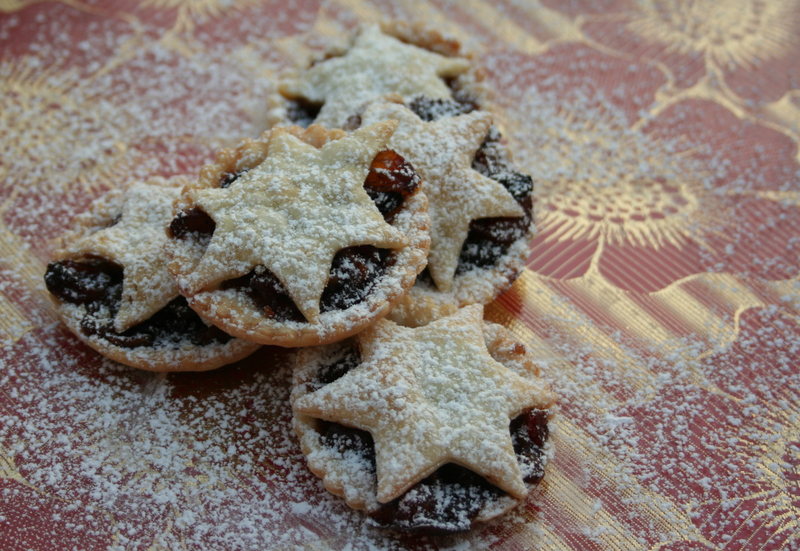 Press the discs into the tart tin and into each put a spoonful of mincemeat up to the rim of the pastry. Press a star lightly onto each pie and bake for about 10-15 minutes until a light brown colour. Remove from the oven and sprinkle with icing sugar. Eat one immediately while writing your list for Santa! 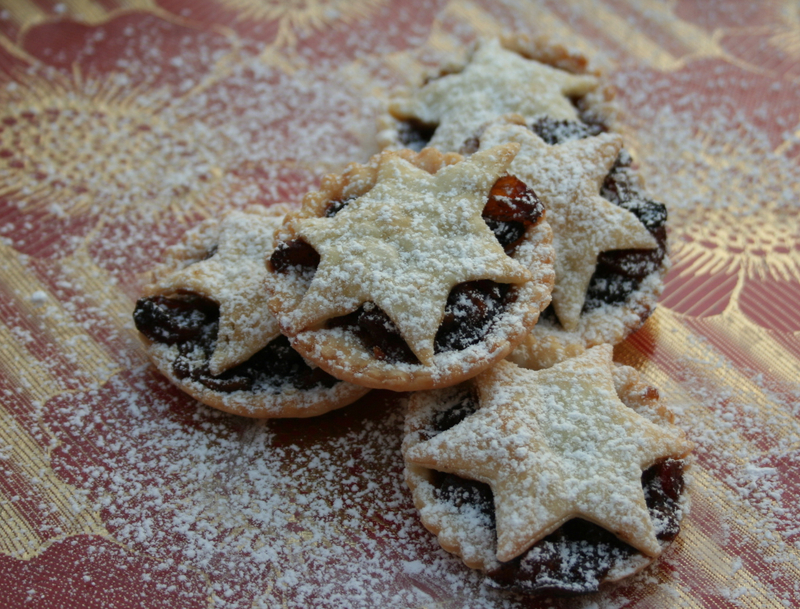 Mince pies can be made up to a week in advance, kept in an airtight tin, then heated in the oven when you need them. mmm,..even i went INA market to buy ingredients for christmas cake,..;-),pie looks perfect,..merry christmas,..
Hope you all had a lovely day – we have to work on a joint Christmas sometime! I lived in England for three years over 30 years ago. We love jam tarts and mincemeat tarts for holidays. I have tried to find some new tarts tins and cannot find them anywhere. Any idea where I could find them?